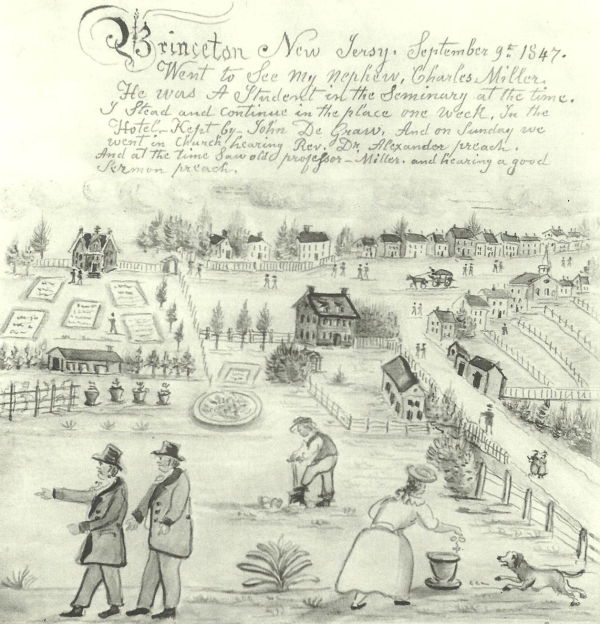 An 1874 lithograph that shows Nassau Street in the middle of a quiet, rural village: Princeton. This geocache is a short historical stroll along the central part of the main street of Princeton. At each waypoint you will answer questions that will allow you to calculate the final cache coordinate. There are quite a few waypoints, but the distance covered is actually very short! Imagine Princeton in 1847, still very much a rural town, and face the ‘Millholland & Olsen’ building. Back then you would have been facing a public garden, described by the visitor whose diary the picture comes from as “well worthy of a visit”! What do Millholland and Olsen specialize in? 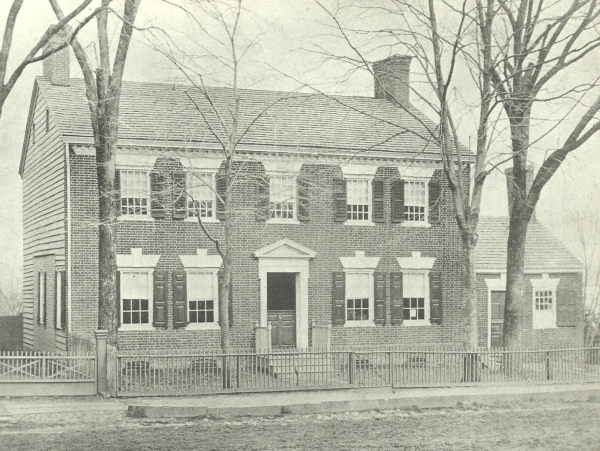 Located at the corner of Bayard and Nassau, this house built in 1823 belonged to Richard Stockton, the son of one of the signers of the Declaration of Independence. A senator, Stockton (Jr.) also unsuccessfully ran for vice-president in 1820. What is the name of the house on the plaque? 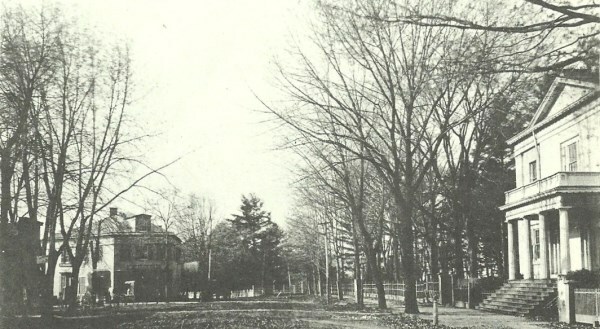 Shown in the picture is the south-west end of Nassau street pre-1896. 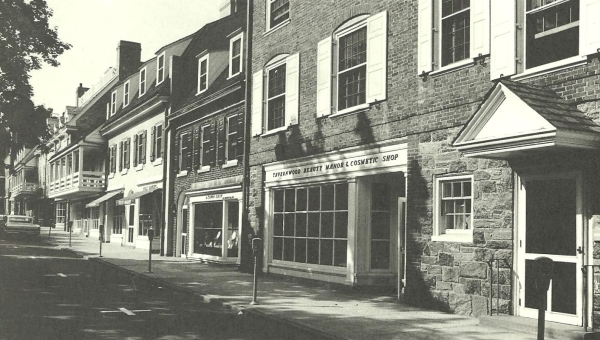 The building on the right of the picture is 4 Nassau Street (which you should now be standing in front of) and originally housed the Princeton Banking Company. The corner building on the left of the picture (originally called the ‘Corner Store’) no longer exists. 4 Nassau Street used to have 4 pillars out front. How many does it have now? This building at 12 Nassau Street, clearly inspired by Dutch colonial style, used to house the Princeton Bank and Trust- it remains one of the most striking buildings on Nassau Street today. How many stone faces can you find on the front of 12 Nassau Street? Now face along Nassau Street towards the centre of town and imagine the time when it looked like below and horse and carriages were still the norm! 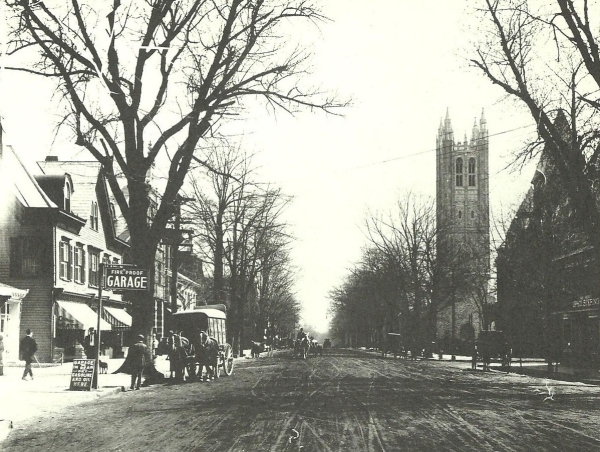 Take note of Holder Tower on the right of the picture that still stands today. 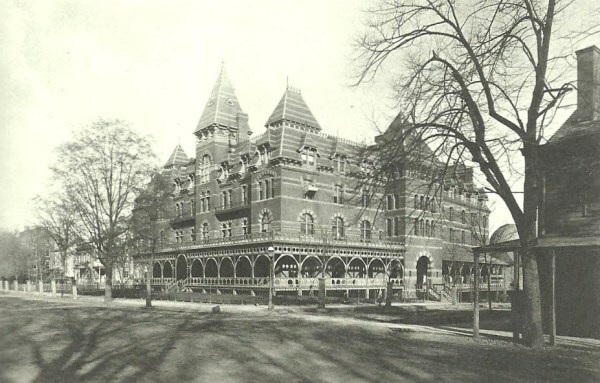 At the corner of University Place and Nassau Street once stood the University Hotel (pictured), built in 1875. It was eventually replaced by a university dining hall. Find the large door hall entrance close to the waypoint. How many black lanterns hang on the door frame? One of the churches on Nassau, St. Andrew’s Church stands at the corner of Nassau and Chambers street. What single instance of a shape is very apparent in the glass windows on the church facade? 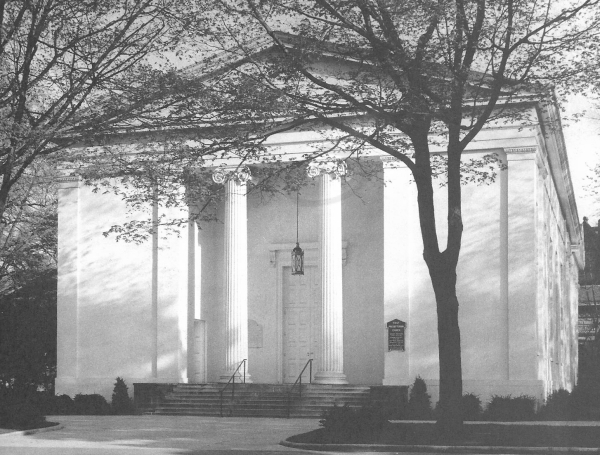 A little further along, we find the First Presbyterian Church with its imposing white building. 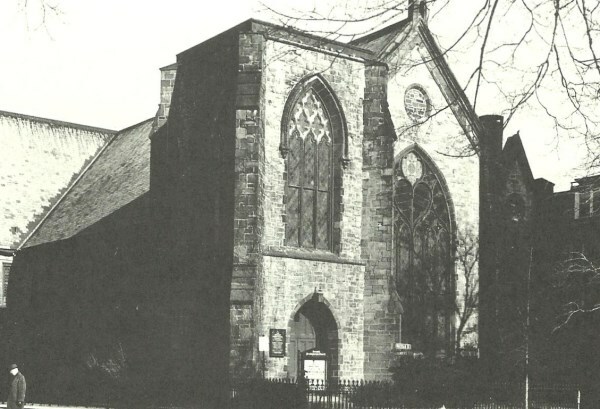 Find the plaque on the church- what year was the First Presbyterian Church erected? Palmer Square, now a central part of Princeton Shopping was built after 1936 and designed to keep a small-town shopping feel, with faux-classical architecture. 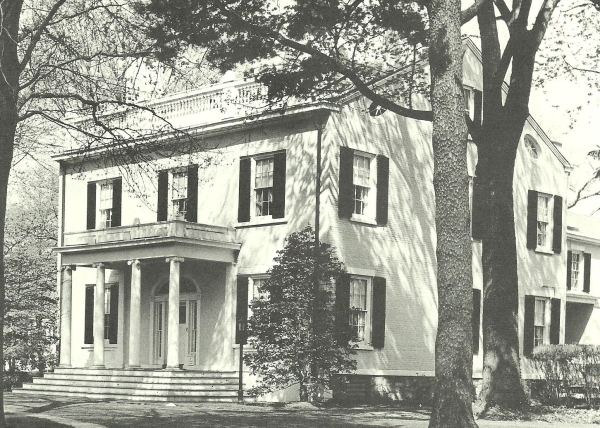 Until 1879, this house was the residence of the presidents of the university (or the College of New Jersey as it was known then) and then became the official residence of the Dean of the Faculty. John Witherspoon, another signer of the Declaration of the Independence also lived here. It now hosts the Princeton University Alumni Association. How many steps are there in front of the Dean’s House (also known as Maclean House or the President’s House)? This waypoint puts you in front of the symbolic entrance of Princeton University, the Fitz Randolph gate. Look down towards Palmer Square and spot the differences with the photo below taken in the early 1860s. 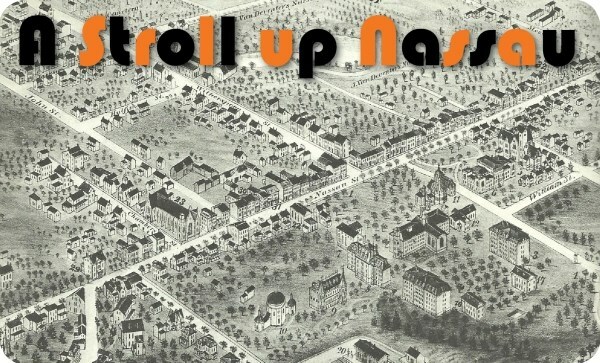 Note how Palmer Square (built after 1937) was not a defining landmark on Nassau Street! 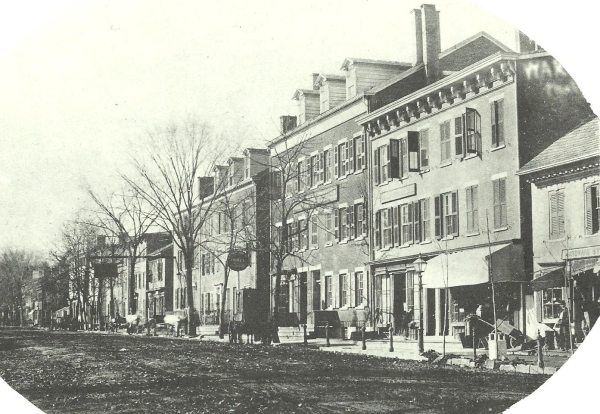 At that time, Nassau Street was lined with many inns, given that Princeton was a convenient stop on the long carriage journey from New York to Philadelphia. Look up at the Fitz Randolph gate. What did Fitz Randolph donate? Pictured is Upper Pyne, built in 1896, that previously stood at 74-76 Nassau Street. 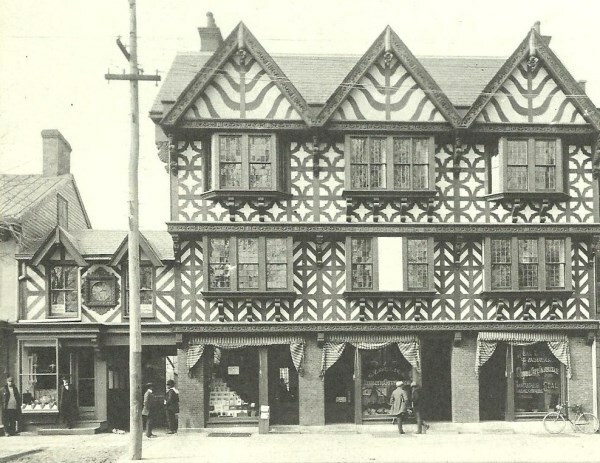 The architect, Pyne, wanted to model some Nassau Street buildings on old British village architecture. 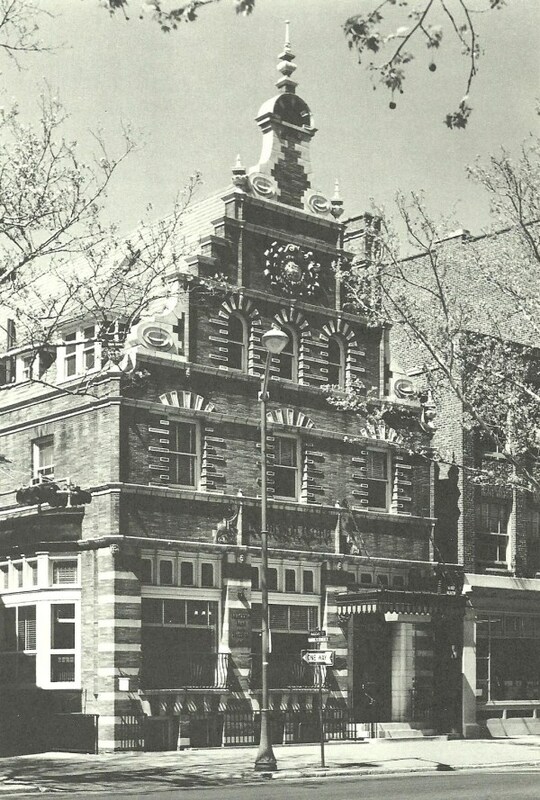 Two such buildings were built and you are now standing in front of Lower Pyne which now houses a jeweler. Upper Pyne in the picture was demolished in 1964. Look up at the façade on Nassau Street- what is the result of number of clock faces multiplied by number of Princeton shields? 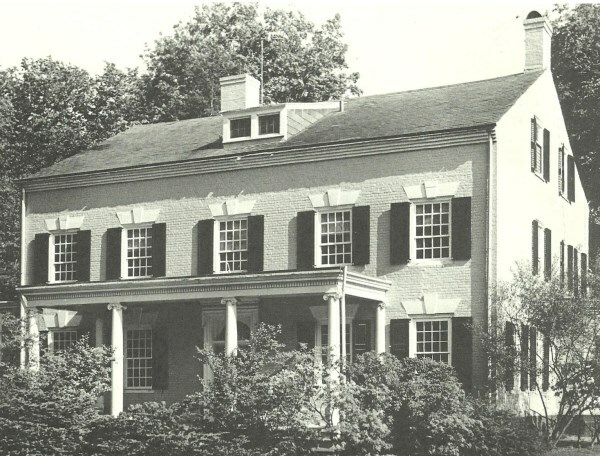 Bainbridge House, built in the mid-1700s, was owned by Robert Stockton, the grandson of Richard Stockton (whom we mentioned earlier). Robert Stockton was a naval commander, famous for capturing California from Mexico. William Bainbridge, another naval commander rented the house from Stockton. Find the small “Princeton Landmark” tag celebrating the bicentennial on the front of the building- what is pictured on it? You’re almost there! Just one more question…. The cache is a small container- watch out, plenty of muggles around! Bring a pen! Many of the pictures from the great text “Princeton Architecture” by Grief, Gibbons and Menzies (1967)- highly recommended! Ybbx zntargvpnyyl oruvaq naq ernpu hc. Trg pybfr gb Sverfgbar.